It’s not a stretch to imagine that in a faraway place long ago, Dan Fewings would have made a very good living as a court jester. When: Friday, October 26, 2018 at 8 p.m. Featuring The Three Martinis (Dan Fewings, Rob Phillips, and Jimmy Bowskill) with special guest Linda Kash. Doors open at 7 p.m. All ages/licensed with a cash bar available. Advance tickets available online. The Simcoe native and retired Peterborough high school teacher has a gift for making people laugh — a gift accentuated by his larger-than-life persona and a full willingness to poke fun at himself in a way that makes all around him feel like they’re being let in on a secret he has held onto for years. 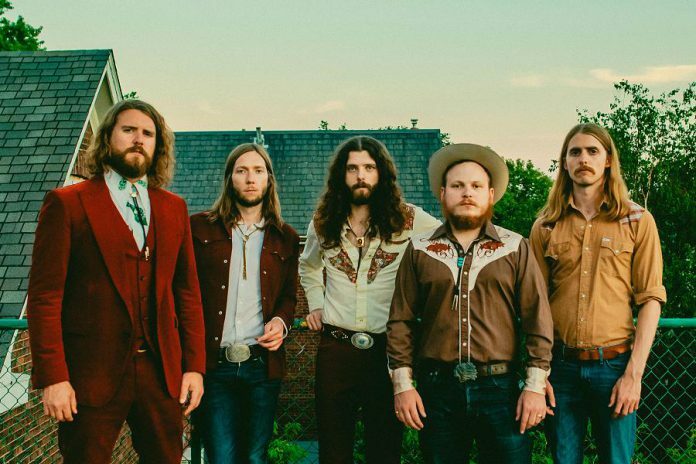 Close to 10 years ago, when he first hooked up with local piano master Rob Phillips — Bailieboro native Jimmy Bowskill on bass joined in shortly after — Fewings found a new outlet for his comedic talents. 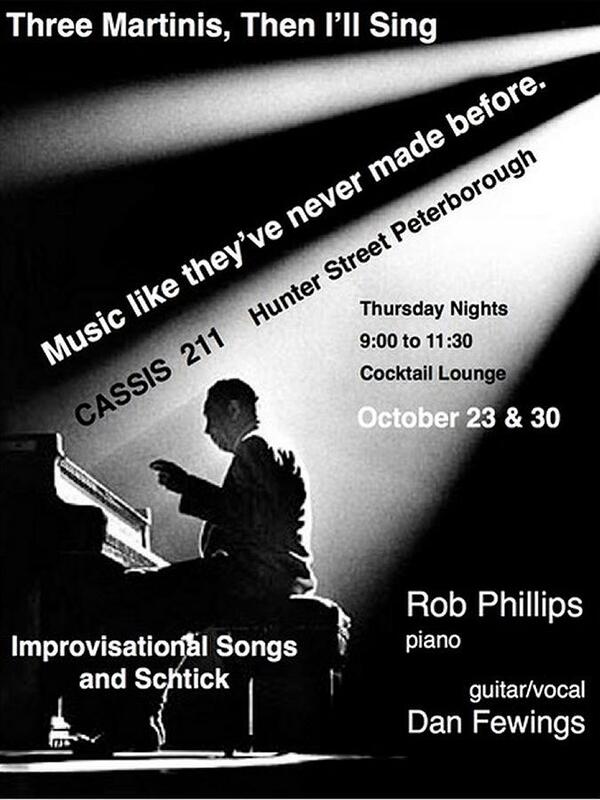 Since debuting at Cassis on Hunter Street West, The Three Martinis have delivered their unique and very funny brand of musical improv comedy to the delight of audiences throughout the Peterborough region and beyond. On Friday, October 26th at The Mount (1545 Monaghan Road, Peterborough), Dan Fewings, Rob Phillips, and Jimmy Bowskill will headline The Three Martini Halloweeny & Tenth Anniversary Party, co-sponsored by kawarthaNOW.com and produced by Fewings’ son Josh (of Mayhemingways fame). There will also be a special guest cameo appearance by Linda Kash. Tickets are $23 in advance or $25 at the door for a regular theatre seat, or $28 in advance or $30 at the door for a cabaret table seat (eight-seat tables). Advance tickets are available now online at www.ticketscene.ca/events/22028/. Doors open at 7 p.m. with the show at 8 p.m. There will also be a cash bar available at the licensed and all-ages show. 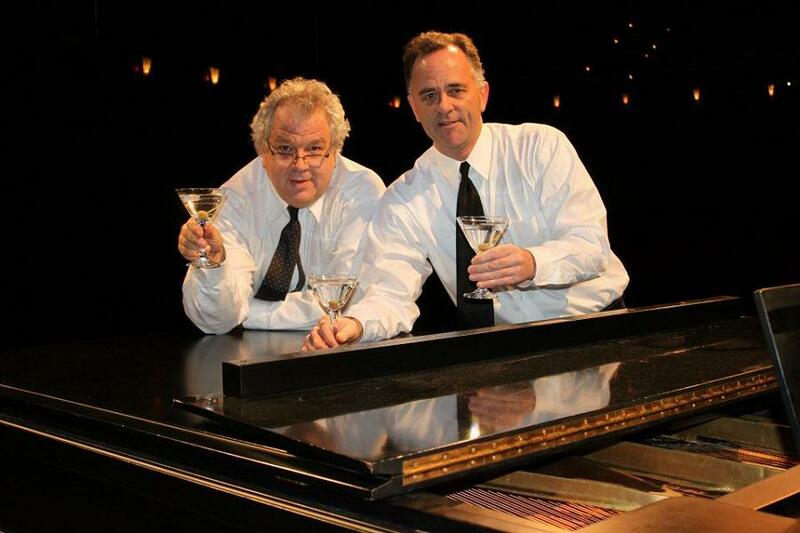 If you’re new to The Three Martinis, how it works is simple: taking their cue from suggested song titles offered up by audience members, the trio goes to work, with Fewings coming up with lyrics on the spot and the other two adding the music based on the genre, which is also often suggested by the audience. Jazz, blues, country — anything is game. So are the guys in the spotlight. It was back in 2009 when Fewings was running his Fabulous Green Roof Children’s Theatre Camp that what was to become The Three Martinis was born. At the camp’s conclusion, Fewings added a week-long adult theatre camp for adults because they “need to play more than kids do.” Staging the old folk story Stone Soup, Fewings asked his friend Phillips to come on board as musical director. “During down time, Rob played Tom Waits type riffs and we wrote stuff on the spot… some of the songs were pretty good,” recalls Fewings. Fewings notes the two ladies promised to “pack this place (Cassis) with our girlfriends” the next time out. 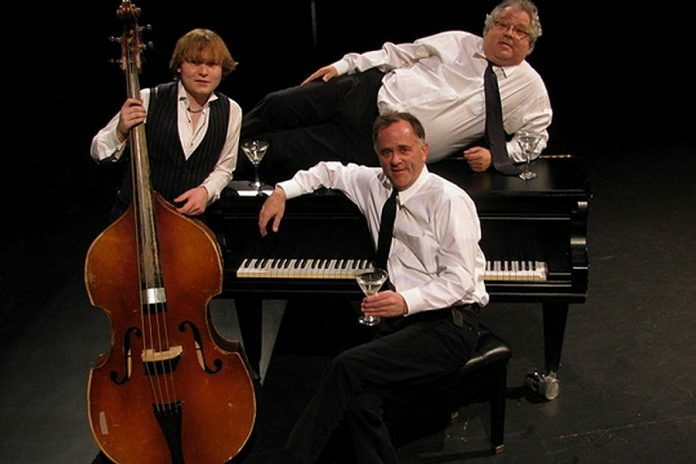 They did just that and word of The Three Martinis’ value-added performance that brings comedy and music together in a very unpredictable way spread very quickly. “We made them (Louise and Jane) the official president and vice-president of The Three Martinis,” quips Fewings. Over the years since, Fewings, Phillips, and Bowskill have pursued individual projects — Fewings is a professional clown, guitarist, and event emcee and runs his Green Roof workshops; Phillips is an accomplished singer, keyboardist, and songwriter with several recordings to his credit; Bowskill is a working musician who is also currently performing with the Juno Award-winning rock band The Sheepdogs — but have frequently come together for numerous gigs as The Three Martinis. To understand how out of control a typical performance can get, Fewings references a show performed one Sunday morning east of Peterborough. At the heart of the The Three Martinis’ longevity and success is a mutual respect that each has for the other. “Rob has a great comedic sense; one of the frustrations I have is his jokes are always better than mine,” says Fewings. For his part, Phillips praises Fewings’ comedic mind and resulting genius. “I worked at Second City and I worked with tons of different people over six years … Danny hits a home run eight out of ten times,” says Phillips. The key, adds Phillips, is to not let a song go on too long. “If we’re going along and there’s a big laugh, we kill it,” he says. Suffice to say the snowflake analogy is inescapable when describing a typical Three Martinis show — no two are even remotely alike. “You really have to have a funny take on the world, the absurdity of it all,” says Phillips of what makes it all work. Inducted into the Peterborough Pathway of Fame in 2016, Fewings is as equally busy in Simcoe as he is here, performing in a folk duet there as well as doing solo shows. He’s also directing a show for the Young Theatre Players. 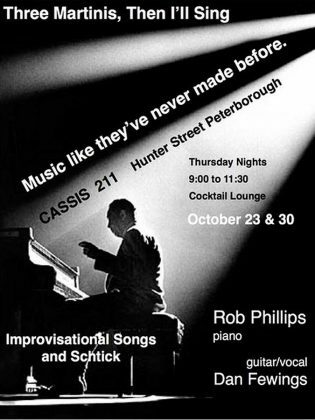 Phillips, meanwhile, is finishing up a jazz-blues album in Toronto as well as performing regularly in Peterborough and area. As for the October 26th show at The Mount, in addition to celebrating the 10th anniversary of The Three Martinis, Dan will also be celebrating his 60th birthday.